I have an exciting little review today of these new (as far as I know) textured glitter polishes from the P.S. range in Primark. 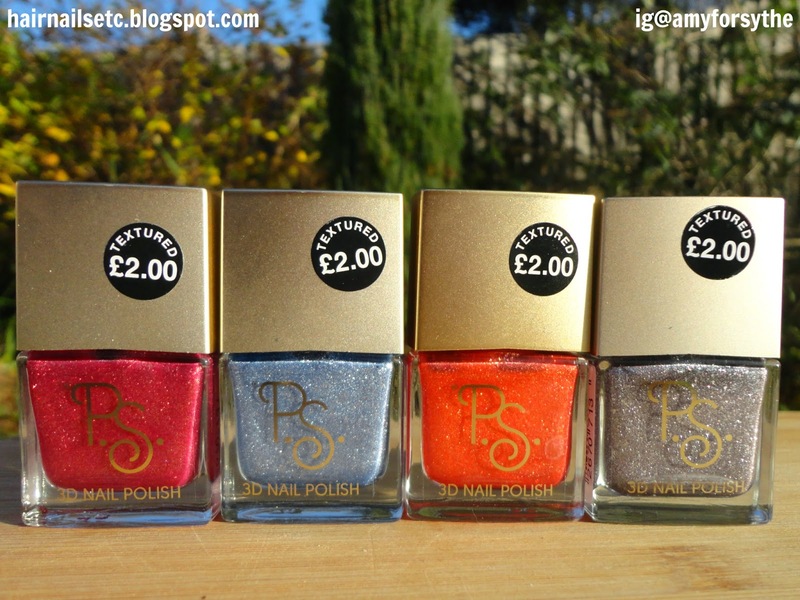 It was your average Sunday shopping trip; I went in to Primark to buy a Christmas jumper and left with three large bags of goodies, amongst them were these four polishes. I haven't seen them before, and really don't know much about them, there isn't even names or numbers on the bottle and these were all the colours on the display. However I was really pleased with the P.S. creme polishes I bought in the summer and for just £2 a bottle I thought they were worth a punt. Keep reading to see if it paid off! First I have this Red/Gold Texture. I used two coats and no top coat. 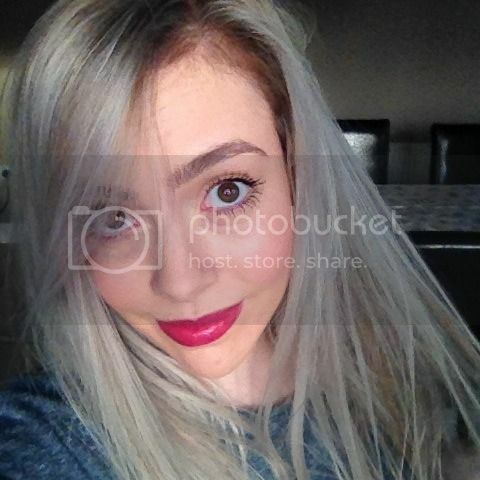 This raspberry red shade is so pretty, the pink tinge means it's nicely flattering and not too harsh on my pale skin. It's packed with golden shimmer which makes it instantly festive and the fine texture reminds me of red fruit pastilles! Next is this super jazzy Orange/Gold Texture. Again I used two coats and no top coat. On the first coat this looked quite sheer but with a second it was fully opaque and lightly textured. 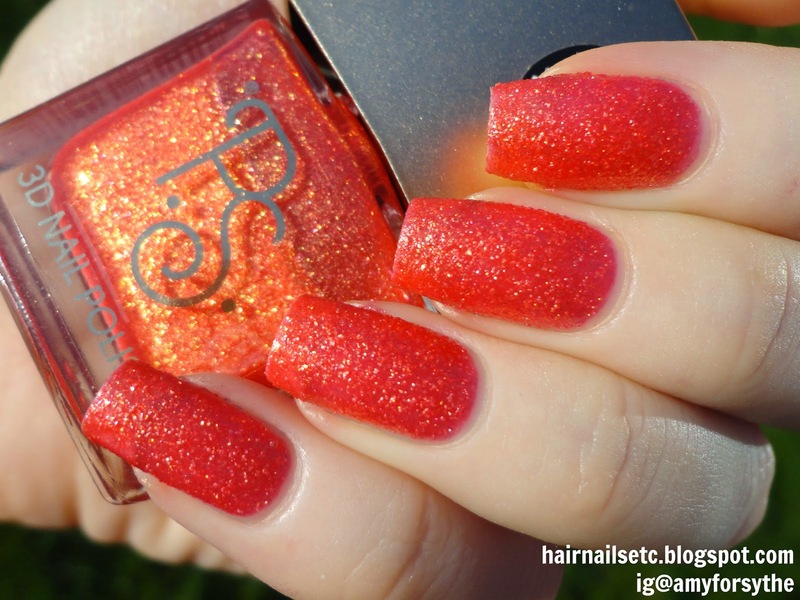 I really love this vibrant orange and the fine gold shimmer gives a subtle sparkle. This is a gorgeous gunmetal Grey/Silver Texture, it looks slightly purple in these photos but it is a straight up grey. I used three coats this time for full opacity, no top coat. There are some tiny silver hex glitters thrown in this one, as well as the fine shimmer, which makes it a bit more interesting. Last is this beautiful icy Blue/Silver Texture. Again this needed three coats to be fully opaque, but this was very quick and easy to do. Like the grey polish, this has those extra small glitter pieces in. I really like this shade, I think the pale blue and frosty finish is perfect for winter. It could be great in snowy nail art but it also looks beautiful on its own. Overall I'm really pleased with these polishes. Admittedly I didn't really jump on the 'textured' bandwagon last year and so I don't have many others to compare with but I do think these colours are really great - the orange in particular. Not only that but the formula is excellent: the polish is thick but spreadable making them easy to apply, I didn't need to clean up these swatches at all! Also they dry very quickly so there's no waiting between coats. The brush is wide and flexible, the packaging is neat and they don't have a super strong smell (like the other P.S. polishes I own). Best of all the actual textured finish is very fine, they're not gritty or scratchy and won't catch on your clothes. Of course you could still use a top coat if you wanted to smooth it over and achieve a different effect. And to get all of that for just £2 per bottle I think is great value. What do you think? Has the textured polish trend been and gone? Love this post, it's so informative and you've totally made me want to buy these! Although I'm not mad-keen on textured polish, and I do think it was a bit of a fad that may have been and gone like you suggest....I am always drawn to a glittered texture as I love a full coverage glitter and these are definitely that! I think my favourites are the orange (although not sure how I'd wear it) and the ice-blue. Fab for Primark!! The orange is such a gorgeous colour! ❤️ it! (But I would have bought the others too...) 😁 the price is pretty neat!